Matt and I are still waffling about our honeymoon location. There are so many choices! Since he's out of town and I had the whole evening to myself, I decided to spend the evening doing what I used to do when I was single: run six miles, eat a healthy dinner, wander around the bookstore. Don't get me wrong; now that I'm married I still do those things quite a bit! But I used to follow that routine more regularly (although, when I got depressed about my depressing love life--or lack thereof--I would throw a pint of Amy's ice-cream into the mix. My favorite is Mexican vanilla with cinnamon and cookie dough mixed in. Yum!). I wandered into the travel section to behold all the glossy covers beckoning me to all the amazing cities and countries in our world. Wow! There are so many choices! Matt and I had pretty much narrowed it down to one of the lesser traveled Hawaiian islands (Kauai) or a train trip through Europe. After looking at all the books just to be sure I didn't want to throw another option into the mix, I settled into a comfortable chair with a book about each of our current options. On the one hand, I want to go to Hawaii (even though it's such a cliched honeymoon destination!) because it would be so relaxing and stunningly beautiful and we would have time to run and hike and swim. Ahhhh.... 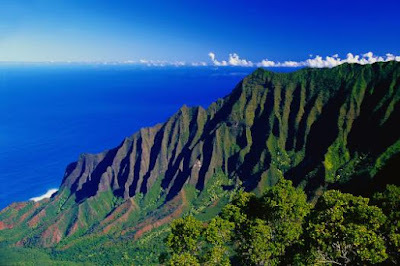 I think we would also attempt the Kalalau Trail, which would be such an amazing challenge (and something that might inspire me to get in better shape!). But then there's Europe. My travel has pretty much focused on Central and South American countries (plus a trip to India), so I've only been to England. I would love to see Europe, and it would be fun to pick a few countries and plan out our itinerary. Our trip could be so diverse (both in terms of scenery and in terms of activity). The books did nothing to clear up my indecision. Argh! But then I realized that this trip doesn't have to be a once-in-a-lifetime vacation. It's our vacation for 2009. And in 2010, we can just take another trip. So maybe it's Europe this year and Hawaii next year. Or Hawaii this year and Europe next year. Editor's Note: Matt and I are not rolling in dough. It's just that we're savers. We don't spend a lot of money on clothes, CDs, books, etc. We have a vacation savings fund, and a little bit of money from every paycheck goes into that fund. So we'll just have to go on a honeymoon every year! It really takes the pressure off. The same thing can be said for a wedding. It doesn't have to be the only really big party/reunion you throw. I don't say that to add more stress to your life ("What?!? I have to do this wedding planning thing all over again?"). I say it because when you're faced with myriad options, it can alleviate the pressure to realize that you can create other opportunities to live out the other options later down the line--if you want to.). I'm so jealous! Can i come? i hear Kaui is gorgeous!!! I recently went to Kauai and loved it! If you are up for additional adventure and even less touristy view of Hawaii head to Moloka'i as well. We did 5 nights in Moloka'i and 4 in Kauai. Amazing trip! My parents just got back from a trip to Kona and they loved it. Even if Hawaii seems cliche, I just don't think it matters. Look at those pictures! It's just so gorgeous - why would you NOT want go there? And I love your "we can go to x place for vacation next year" perspective. Brilliant. PS - I'm ridiculously partial to Belgian Chocolate with Junior Mints crushed in. I'm pretty sure that's the only ice cream I've ever had at Amy's, and I grew up practically down the street from one. Actually, it's still pretty much down the street from me. You will love Kaui-- it's so quiet and sleepy and breathtakingly beautiful. The focus is not on cheesy tourist stuff as it is on other Hawaiian islands, but really on the island itself. I think it will really suit you and your partner! Hawaii is a great choice. My fiance (was a boyfriend at the time) and I went to the Big Island last March. I thought I would have picked Europe instead, but we ended up Hawaii for other reasons. And we really really loved it. There are so many ways to experience Hawaii your own way. Congrats!